A new op-ed in the South China Morning Post with Lifan looking at China and Russia’s relationship and China’s foreign policy more grandly as part of the discussion around the Conference on Interaction and Confidence-Building Measures in Asia (CICA) currently going on in Shanghai. I also spoke to Agence France Presse about the meeting. 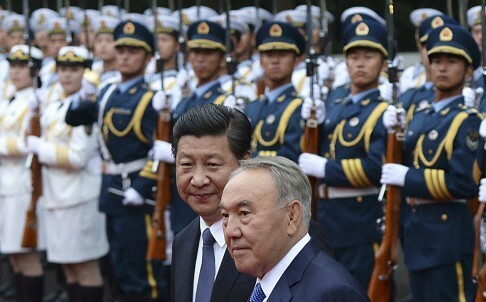 First proposed by President Nursultan Nazarbayev of Kazakhstan in 1992, it took 10 years for the conference to hold its first summit in Almaty. Now with 24 members, nine observer states and four observer organisations, the conference offers an interesting forum where countries with difficult relations can interact. This year, there are high expectations of what it might mean for regional engagement in Afghanistan in the post-drawdown world. The group’s first summit in 2002 was held in the shadow of the September 11 attacks and concluded with a declaration on eliminating terrorism. Non-traditional security threats have always been high on the agenda; in the current environment, they remain a priority. But in many ways, this year’s event will be overshadowed by the interaction between Russia and the various members. Both China and Russia have already hinted that this is finally the year when they will resolve their long-standing gas pricing dispute, and both have indicated they will have substantial bilateral interactions, including military exercises near the time of the conference. The benefits for Russia are obvious. At a time when its relations with Europe and the US are soured over Ukraine, this is an opportunity to interact with a friendly community of nations and show how Russia has other geopolitical options. One has to take a step back, however, to appreciate the benefits for China. For China, the conference is an opportunity to showcase itself as a major power at the heart of a number of different international forums (China is host this year), as well as a moment where Xi can offer a glimpse into his vision for China’s foreign policy. This vision needs to be understood in the context of Chinese strategic considerations. One is the four trade corridors: the Silk Road economic belt (through Central Asia); the China-Pakistan Economic Corridor; the Bangladesh-China-India-Myanmar Forum for Regional Cooperation; and the maritime Silk Road. These are really four strings of the same instrument – one that flows from Xi’s comments about the importance of China’s border relationships late last year. Foreign policy under Xi is one in which China will play an increasingly proactive role, founded on practical economic relationships, but also one that is heavily focused on multilateral cooperation. Xi wants his foreign policy to be seen as all about regional cooperation and integration. For China, the meeting is in many ways an expression of this. Bringing together contentious partners and old friends alike, it highlights China as a major power that can convene important conferences with all sorts of actors around the table. Its concepts of “peaceful development” and “new great power relations” are both captured within this bigger vision. The reality, of course, is that this is the natural state of international relations between states, where contentious relations sit alongside necessary cooperation. But it is significant that Xi has seen it as such a critical concept. Li Lifan is secretary general of the Centre for SCO Studies at the Shanghai Academy of Social Sciences. Raffaello Pantucci is senior research fellow at the Royal United Services Institute.